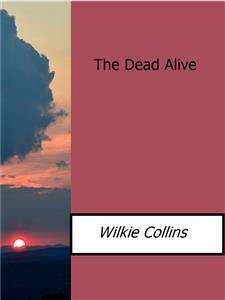 The Dead Alive is a novel written by Wilkie Collins based on the famous Boorn Brothers murder case, reprinted with a side by side examination of the case by Rob Warden in 2005 by Northwestern Press. 7.The Materials in the Defense. 10. The Sheriff and the Governor. 11. The Pebble and the Window. 12. The End of it. So the doctor spoke, in my chambers in the Temple (London); having been sent for to see me about half an hour after I had alarmed my clerk by fainting at my desk. I have no wish to intrude myself needlessly on the reader’s attention; but it may be necessary to add, in the way of explanation, that I am a “junior” barrister in good practice. I come from the channel Island of Jersey. The French spelling of my name (Lefranc) was Anglicized generations since — in the days when the letter “k” was still used in England at the end of words which now terminate in “c.” We hold our heads high, nevertheless, as a Jersey family. It is to this day a trial to my father to hear his son described as a member of the English bar. The senior counsel in the case on which I was engaged applied to me for some information which it was my duty to give him. To my horror and amazement, I was perfectly unable to collect my ideas; facts and dates all mingled together confusedly in my mind. I was led out of court thoroughly terrified about myself. The next day my briefs went back to the attorneys; and I followed my doctor’s advice by taking my passage for America in the first steamer that sailed for New York. I had chosen the voyage to America in preference to any other trip by sea, with a special object in view. A relative of my mother’s had emigrated to the United States many years since, and had thriven there as a farmer. He had given me a general invitation to visit him if I ever crossed the Atlantic. The long period of inaction, under the name of rest, to which the doctor’s decision had condemned me, could hardly be more pleasantly occupied, as I thought, than by paying a visit to my relation, and seeing what I could of America in that way. After a brief sojourn at New York, I started by railway for the residence of my host — Mr. Isaac Meadowcroft, of Morwick Farm. Mr. Meadowcroft’s eldest son, Ambrose, was waiting at the station to drive me to the farm. There was no forewarning, in the appearance of Ambrose Meadowcroft, of the strange and terrible events that were to follow my arrival at Morwick. A healthy, handsome young fellow, one of thousands of other healthy, handsome young fellows, said, “How d’ye do, Mr. Lefrank? Glad to see you, sir. Jump into the buggy; the man will look after your portmanteau.” With equally conventional politeness I answered, “Thank you. How are you all at home?” So we started on the way to the farm. Our conversation on the drive began with the subjects of agriculture and breeding. I displayed my total ignorance of crops and cattle before we had traveled ten yards on our journey. Ambrose Meadowcroft cast about for another topic, and failed to find it. Upon this I cast about on my side, and asked, at a venture, if I had chosen a convenient time for my visit The young farmer’s stolid brown face instantly brightened. I had evidently hit, hap-hazard, on an interesting subject. I vaguely remembered that a younger sister of Mr. Meadowcroft’s had married an American merchant in the remote past, and had died many years since, leaving an only child. I was now further informed that the father also was dead. In his last moments he had committed his helpless daughter to the compassionate care of his wife’s relations at Morwick. Once started on the subject of Naomi Colebrook, Ambrose held to that one topic and talked on it without intermission. It required no great gift of penetration to discover the impression which the American cousin had produced in this case. The young fellow’s enthusiasm communicated itself, in a certain tepid degree, to me. I really felt a mild flutter of anticipation at the prospect of seeing Naomi, when we drew up, toward the close of evening, at the gates of Morwick Farm. The old man had become a confirmed invalid, confined by chronic rheumatism to his chair. He received me kindly, and a little wearily as well. His only unmarried daughter (he had long since been left a widower) was in the room, in attendance on her father. She was a melancholy, middle-aged woman, without visible attractions of any sort — one of those persons who appear to accept the obligation of living under protest, as a burden which they would never have consented to bear if they had only been consulted first. We three had a dreary little interview in a parlor of bare walls; and then I was permitted to go upstairs, and unpack my portmanteau in my own room. “Supper will be at nine o’clock, sir,” said Miss Meadowcroft. She pronounced those words as if “supper” was a form of domestic offense, habitually committed by the men, and endured by the women. I followed the groom up to my room, not over-well pleased with my first experience of the farm. My room was clean — oppressively clean. I quite longed to see a little dust somewhere. My library was limited to the Bible and the Prayer–Book. My view from the window showed me a dead flat in a partial state of cultivation, fading sadly from view in the waning light. Above the head of my spruce white bed hung a scroll, bearing a damnatory quotation from Scripture in emblazoned letters of red and black. The dismal presence of Miss Meadowcroft had passed over my bedroom, and had blighted it. My spirits sank as I looked round me. Supper-time was still an event in the future. I lighted the candles and took from my portmanteau what I firmly believe to have been the first French novel ever produced at Morwick Farm. It was one of the masterly and charming stories of Dumas the elder. In five minutes I was in a new world, and my melancholy room was full of the liveliest French company. The sound of an imperative and uncompromising bell recalled me in due time to the regions of reality. I looked at my watch. Nine o’clock. Mr. Meadowcroft’s invalid chair had been wheeled to the head of the table. On his right-hand side sat his sad and silent daughter. She signed to me, with a ghostly solemnity, to take the vacant place on the left of her father. Silas Meadowcroft came in at the same moment, and was presented to me by his brother. There was a strong family likeness between them, Ambrose being the taller and the handsomer man of the two. But there was no marked character in either face. I set them down as men with undeveloped qualities, waiting (the good and evil qualities alike) for time and circumstances to bring them to their full growth. He was short, spare, and wiry; singularly pale for a person whose life was passed in the country. The face was in other respects, besides this, a striking face to see. As to the lower part, it was covered with a thick black beard and mustache, at a time when shaving was the rule, and beards the rare exception, in America. As to the upper part of the face, it was irradiated by a pair of wild, glittering brown eyes, the expression of which suggested to me that there was something not quite right with the man’s mental balance. A perfectly sane person in all his sayings and doings, so far as I could see, there was still something in those wild brown eyes which suggested to me that, under exceptionally trying circumstances, he might surprise his oldest friends by acting in some exceptionally violent or foolish way. “A little cracked”— that in the popular phrase was my impression of the stranger who now made his appearance in the supper-room. Mr. Meadowcroft the elder, having not spoken one word thus far, himself introduced the newcomer to me, with a side-glance at his sons, which had something like defiance in it — a glance which, as I was sorry to notice, was returned with the defiance on their side by the two young men.